A reckless motorcycle rider is facing pending charges this week after a California Highway Patrol helicopter captured him speeding and smashing a driver's side mirror, according to CHP Oakland. 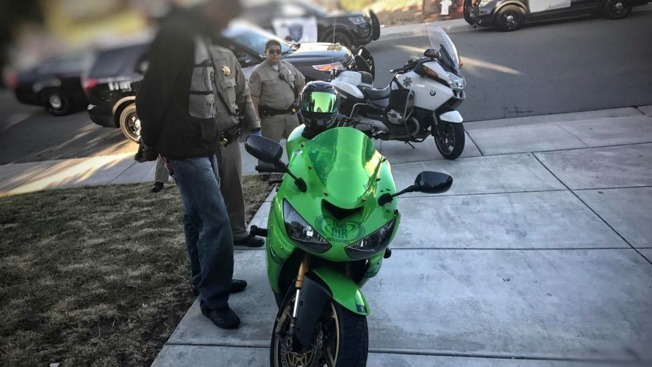 The man riding on the green Kawasaki motorcycle could be seen on an East Bay highway come within inches of a white SUV and take a swing at the car's right side mirror. He was followed to his home by the helicopter and met by officers on the ground at his residence, according to the CHP. "The eye in the sky caught ya!" CHP Oakland wrote on Facebook. The motorcycle rider is facing pending charges for reckless driving, vandalism and suspended registration. His motorcycle was also impounded. "If you're one that thinks you can ride recklessly on the highways, smash people's side view mirrors, and drive at speeds well over 100 mph, think again," CHP Oakland wrote on Facebook. The dangerous act caught on camera was one of many the man committed on a Bay Area roadway last week, according to the CHP. Anyone who was victimized by the motorcycle rider is asked to contact the CHP at 925-646-4980.